Due to regulations by the FDA, skin sanitizers and skin products may be recalled for contamination or other issues that pose a threat. The FDA, or Food and Drug Administration, issues recall warnings when they discover products that may be unsafe. You can view current warnings and recalls on the FDA website at www.fda.gov. The FDA also typically issues press releases, and news media often provides recall and warning information. Skin sanitizer safety issues are especially disconcerting to consumers since the substances are designed to protect from and prevent illness and infection. 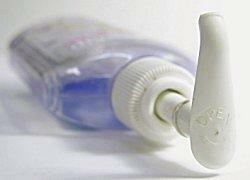 Below are recent skin sanitizer safety issues uncovered by the FDA. If you have experienced an adverse reaction to a recalled skin sanitizer or other recalled product, visit the FDA's MedWatch adverse reporting page or contact by phone at 1-800-332-1088. These two sanitizers were found by the FDA to contain high levels of bacteria known as Burkholderia cepacia. These bacteria can cause serious infections that may require medical attention. The products are manufactured by Puerto Rico Beverage Inc. The products are distributed by Lord Pharmaceuticals LLC, Bee International Distributors, and Morales Distributors Inc. Skin sanitizers manufactured by Clarcon Biological Chemistry Laboratory Inc. prior to June of 2009 should not be used. Worry about colds, flu, and other viral and bacterial illnesses have prompted widespread use of skin sanitizing agents in recent years. However, skin sanitizers from the Roy, Utah-based Clarcon were recalled because they could be spreading bacteria rather than preventing it. In June 2009, Clarcon voluntarily recalled a variety of its skincare products, including sanitizers, after an inspection from the FDA revealed many of the products contained unsafe levels of bacteria that could harbor disease. The inspection also revealed that possible unsanitary manufacturing conditions were involved in the product contamination. The FDA issued a warning that no Clarcon products should be used. US Marshall seized all products and product ingredients. Bacteria found in these products were especially concerning because some of the products suggested usage on broken or damaged skin. The bacteria could damage skin and its underlying tissue, possibly serious enough to need surgical attention. Fortunately, no cases of infection from these products have been reported to the FDA. Consumers who have these products manufactured prior to the FDA inspection should dispose of them immediately. In order to prevent an adverse reaction to a recalled skin sanitizer, consumers should be aware of current recalls, use only FDA approved sanitizer products, and watch the skin carefully for any unusual occurrence after using a sanitizer. Regular hand washing should be the first defense against bacteria and viruses, and hand sanitizer used only when access to soap and water is not possible. When choosing sanitizers, opt for trusted brands and check the ingredient labels. Sanitizers are most effective with 62 percent ethanol. Consumers should also moisturize hands regularly, as sanitizers can be drying and contribute to cracks and cuts in the skin. These, in turn, leave the skin more vulnerable to bacteria and infection. Parents should also take precautions to keep any alcohol-based hand sanitizers out of reach of children.